Before moving to France, I didn’t do much cycling: in fact I didn’t even have a bike. This wasn’t just because of the weather (although cycling is never that appealing in the rain) but because I am not really into adrenaline sports and getting on a bike in the UK always seemed a dangerous rather than relaxing pastime. I think it is something to do with the mentality of many British drivers and the fact that it appears to be ingrained in drivers in the UK to see cyclists as pests; hence cars pass far too close, hoot if they think you are in their way and generally seem to resent sharing the road space. Fantastic as it is that we now have the positive cycling role models of Wiggins, Froome and Hoy who have certainly hugely increased the popularity of cycling in the UK, it certainly doesn’t seem to have made the roads any safer and I never feel that England is a fun place to ride a bike. The problem is that there is no real cycling tradition in the UK, unlike in Holland, Italy and, of course, France. 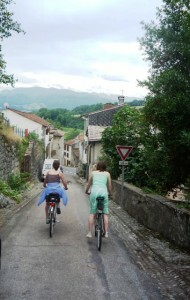 In these countries push-bikes are an integral part of the culture, and drivers have an in-built respect for cyclists. No wonder Britain’s best professional cyclists base themselves abroad, where they are assured of a warmer climate, better road conditions and a positive attitude to cycling. In France, there is not only respect for cyclists but a real cycling culture so that you will see both lycra-glad super humans ascending apparently vertical mountains but also old ladies on pre-war bikes with a baguette under one arm and a basket of vegetables balanced precariously on their handlebars. And both sorts of cyclists are given equal deference and distance by motorists and will also greet each other politely with a cheery bonjour as they pass; you don’t have to be an Olympic medal hopeful to be given respect on the roads here. 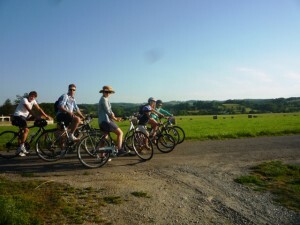 Perhaps it is also to do with the slower way of life but cycling in France is more relaxing and a great way to spend some time en famille. There is much more space, open countryside and pretty villages to explore, as well as course as numerous bakeries and cafés to sample en route. And you can guarantee that anywhere you arrive en vélo, you will get a warm welcome. The French are generally interested in bikes too; my first trip on a bike to France was on a tandem with my future husband (yes we still got married!) We borrowed the tandem from friends and took the ferry to France and cycled to Honfleur and then Pont L’Eveque. Now riding a tandem is something else again and we were so wobbly we could only stay upright by emptying the panniers of everything save our toothbrushes but we improved as the days went on and everywhere we stopped, a crowd gathered to admire the bike and chat; somehow a rosbif on wheels is deemed more acceptable.